Here you will find some suggestions to improve your pronunciation. Watch a video by Mr. Duncan to understand Phonetics. You don´t know how to pronounce that difficult word, do you? Why don´t you watch a Youtube video in which is pronounced? That is precisely YouEnglish. You type a word in English and watch a video of somebody pronouncing it in context, Enjoy it! On Podomatic you can create an account on this podcasting website and record yourself on your Smartphone or PC and then upload the sound file to the site for you and your classmates to hear. 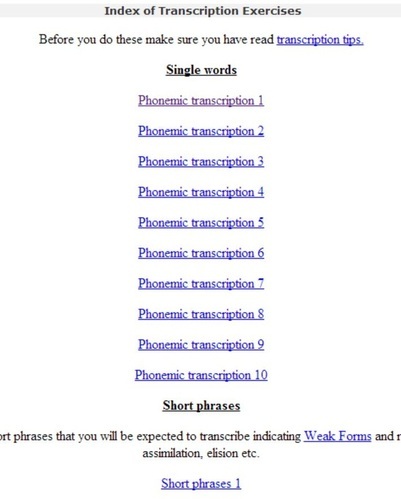 Listen to how to pronounce words on www.howjsay.com/index.php?word=temporary&submit=Submit is a website where you can listen to words. Just type the word you want to hear and listen to it passing your pointer over it. You should watch them all and repeat them if you find understanding English difficult.